Michael Learns To Rock (MLTR), Denmark's biggest pop-rock band, will be coming to Cebu in December, as part of its Still Asian Tour 2018/2019. The multi-platinum selling trio of Jascha Richter, Mikkel Lentz, and Kåre Wanscher will be performing December 7 at Pacific Grand Ballroom of Waterfront Cebu City Hotel. Since their debut album in 1991, MLTR has released multiple hit singles with global record sales of over 11 million physical albums, more than 6 million paid downloads, estimated 50 million video views on YouTube and more than 50 million streams on Spotify. The MLTR story is not only one of the most successful to ever come out of Denmark, but also a story of an exception: their path to success has never been about scandals, divorce, drugs or any extreme way of living. It has always been about the music! MLTR is simply about great pop songs that resonate with people all over the world, especially Filipinos. 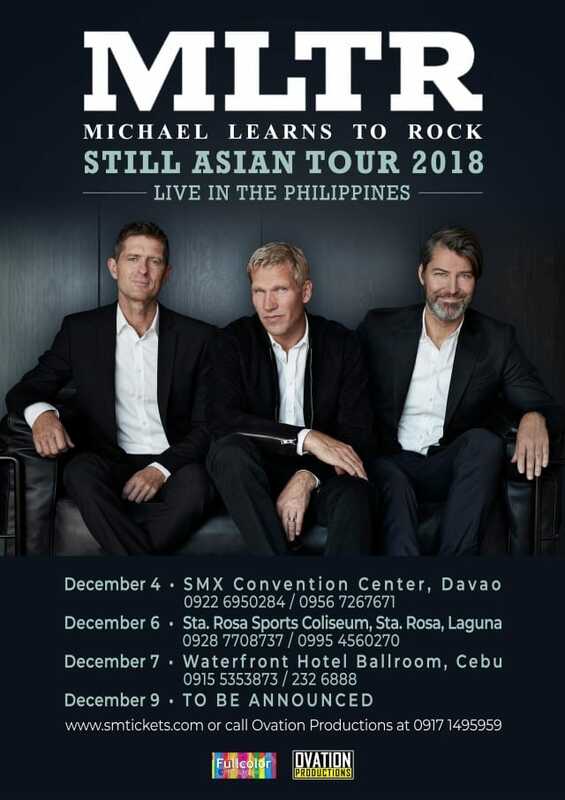 Come join MLTR this December in their much awaited Cebu performance and sing-along to all of their hit songs. The Michael Learns To Rock Cebu concert is produced by Renen de Guia’s Ovation Productions, the same group that brought to Cebu Tears For Fears, Boyz II Men, Sergio Mendes, Engelbert Humperdinck, The Manhattan Transfer, and many other world-class performers.